REUTERS/Kevin LamarqueU.S. President Barack Obama at a campaign rally for Maryland Lt. Gov. Anthony Brown. 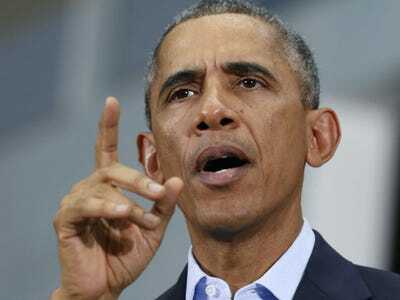 President Barack Obama’s much-touted plans to implement immigration reforms through executive action is set to arrive this Friday, according to a new report in CNBC. The outlet, citing anonymous sources, reported that Obama will officially announce the executive action in Las Vegas, Nevada. CNBC said it’s possible Obama could give an outline of his plans the day before as well. The expected executive order has already set off a storm of controversy and Republican lawmakers have widely called the move illegal. House Speaker John Boehner (R-Ohio) has further said Obama will kill any chance for comprehensive reform if the president acts on his own. Citing congressional inaction on the issue, Obama has repeatedly insisted he has the authority to enact limited reforms. Though it’s not clear what actions Obama will take, he could move to limit the deportations of up to five million undocumented immigrants and provide work permits, according to CNBC. While Republicans can be expected to castigate Obama and look for ways to thwart him next year, when the party will control both chambers of Congress, Democrats and activists have urged Obama to go big. “[W]e fully support your decision to use your well-established executive authority to improve as much of the immigration system as you can,” the Senate Democratic leadership told Obama in a Monday letter. infuriated immigration reform advocates when he backed off his self-imposed deadline for executive action last summer.